Dr. Jeremy Howell board-certified healthcare administrator and has taught healthcare administration/management courses and several institutions of higher learning. He retired in the summer of 2018 from the United States Navy after 20 years of service as a healthcare administrator in the Medical Service Corps. Dr. Howell’s military career afforded his family the opportunity to travel all over the world. He enlisted in the U.S. Navy in July 1998 from the great state of Alaska and underwent boot training at NTC Great Lakes, Illinois. Following bootcamp, he completed Hospital Corps School in Great Lakes, Illinois. 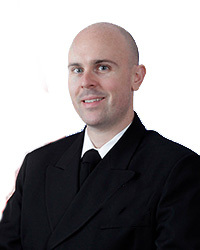 Dr. Howell was commissioned as a healthcare care administrator in the Medical Service Corps in 2008 after serving 10 years as a Hospital Corpsman and he served in a variety of roles to include service as a department head of human resources, the executive aide to the Deputy Surgeon General of the Navy and as a medical intelligence officer. He earned an undergraduate degree in technical management from Embry-Riddle Aeronautical University and a graduate degree in health administration from U.S. Army-Baylor University. Dr. Howell earned a Doctorate of Health Administration from the University of Mississippi Medical Center. He is a Fellow in the American College of Healthcare Executives. Dr. Howell was also selected to serve as a Commission on Accreditation of Healthcare Management and Education (CAHME) Fellow, beginning in 2019.